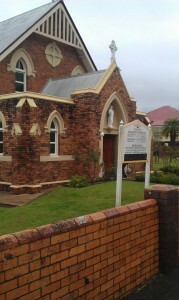 I have attended Mass at the Sacred Heart church in Booval three times, now. For someone who’s church experience is predominantly in Protestant churches, I found a few things to notice with interest. I might start by saying that, although “high church” traditions such as the Roman Catholic, Anglican, and Lutheran are frequently criticised for being boring and irrelevant. I didn’t find it boring or irrelevant, and I actually quite enjoyed it. As I entered the church, on each occasion I was welcomed warmly at the door. Once inside, I sense that many people are feeling very contemplative, and not particularly talkative. People are certainly nice enough, but it is quite apparent that many people use that time, as the organ plays before the service, to pray and to prepare their hearts for the service. What a blessing! Once the service started I found it difficult to figure out exactly where we were at any point in time, and which responsorial I was supposed to be saying, or which hymn I was supposed to be singing. Although this could be improved, it was to be expected, and I didn’t mind at all. One of the most striking things about a traditional church is the architecture. 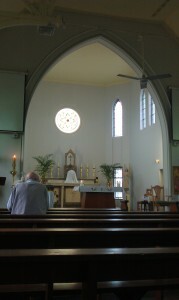 There are lots of features, but the most interesting for me was the sanctuary, where the altar is sitting. I spent some time just pondering it. Some of the Middle Ages Reformers retained the Sanctuary and some (mainly the iconoclasts) abolished it, seeing it as a throwback to pagan Roman architecture. One of the complaints, as I remember it, arises from the Christian teaching which includes the heavenly sanctuary being perennially open to the believer, so the symbolism of a sacred area reserved for clergy was not considered acceptable. One wonders, however, whether such an objection would have been raised if there weren’t other polemics at the same time. As it is, I can appreciate the symbolism of the priest bringing the bread and wine from the sanctuary and dispensing it to the people. It’s not an entirely unhelpful symbol. I was quite amused at the physical discomfort I was enduring in the wooden pews. Not that I mind sitting on a hard surface, but the kneeling board on the floor prevented my (overly large) feet from being able to comfortably support my weight while standing. I found myself twisted to the side, or slouching in a most irreverent way when I had to stand (frequently, 🙂 ). I think it’s quaint that such discomfort is patiently endured by anyone with a shoe size larger than about a 10. A seeker-friendly church would be mortified! It fascinated me that the wording of the Eucharistic celebration is quite profoundly different from what I understood to be the traditional Roman Catholic wording, which has been defended at the cost of much blood and many words for four hundred years. The Transubstantiation is not announced (although presumably assumed), and instead, the “sacrifice” of a life of faith is offered by the congregation, along with the perpetual sacrifice of Christ, and the language leaves one almost without doubt that the bread and wine are no more than a memorial or a symbol! I have enquired about this before, and that revealed some interesting information about the way that the Missal wording has changed in recent times. The Nicene Creed is recited at every service (the one with the filioque). This is a wonderful historical throwback. I recently wrote an essay about creeds. Suffice to say that the main purpose of a creed is to define what is “orthodox” (believed), and what is “heresy” (to be discarded, ignored, or anathematised). Creeds always tell a story about the various disputes that were raging at the time of their composition. This one was ratified in 381AD, although parts of it were subsequently modified further. I found it interesting that there really was nowhere for people to sit after church and enjoy each other’s company, and no real expectation by anyone that they would do so. That was radically different to what I’m used to, with the time after church a very valuable window of time for catching up with all my church friends. The preaching really surprised me. (Pleasantly!) I am used to a fairly regular diet of expository preaching, which means opening a Bible passage and at least rooting the message in that passage, taking the contextual Biblical meaning and using that to form a message for the modern audience. That was essentially the style of preaching we had at Sacred Heart. The reason it attracted my attention is firstly that for the last three years we have been involved in a Pentecostal church. The tradition in Pentecostal circles is not to do expository preaching, but to preach on a topic of the preacher’s choice, referring to the Bible only as required. This is done for reasons of “relevance”, but arguably ends up being irrelevant to everyone other than the audience it is designed for. Biblical expository preaching assumes that the Bible is already relevant… to everyone. But it goes beyond simply noting a difference in style. This is actually deeply ironic. The Protestant Reformation was marked by a heavy emphasis on expository preaching, and the Protestant movement has been characterised fairly consistently with that focus ever since (Pentecostalism represents a very modern shift of focus). The Roman Catholics, meanwhile, appear to have sharpened their interest in actually preaching directly from the Biblical text, which has historically been less important (because the Protestants are characterised by such a practice, it was probably considered a little bit suspect!). The approach was thorough, and could not be criticised for elevating any one of these issues above the others, which is the kind of wisdom that comes from a two thousand year tradition of contemplation of the nature of the church. I was quite impressed. 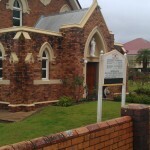 I look forward to going back to Sacred Heart Booval from time to time. The people are happy, friendly and spiritually engaged in the service, and the various clergy I have encountered there appear equally authentic and engaged.